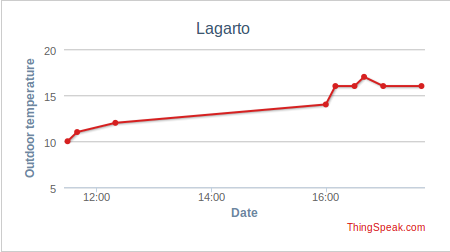 Lagarto-MAX is now available for download from SVN. With this new client we can integrate multiple lagarto servers and manage their values from a single interface. Lagarto-MAX provides the necessary tools to connect endpoints between them, take decisions and push values to the cloud. Simple thread-independent interface for running user Python scripts. Python API for managing values such as "get_value" or "set_value"
Web events can be of different nature: control lagarto endpoints (SWAP, ...) periodically or on a given date, watch for value changes and push them to the cloud, etc. At the moment of writing this post and with regard to the cloud services only Pachube and ThingSpeak are supported. However, adding support for new services is really easy so we can expect to provide connectivity with new cloud-based platforms in the short term. 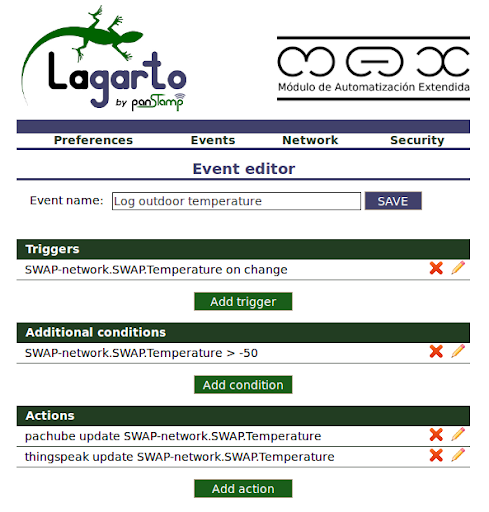 print "Temperature in SWAP is", value, " C"
Lagarto-MAX is already documented in our wiki. I expect to post some screencasts showing the creation of events from the web interface soon.